Walk confidently carrying the proven protection of the First Defense® MK-4 1.3% Foam from Defense Technology. 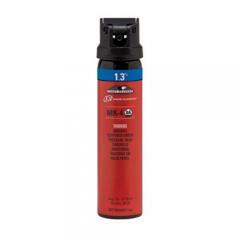 Powerful, reliable and potent, the specially formulated spray is guaranteed to stop even the most determined aggressor in their tracks. A foam delivery system deploys a fast-acting foam formula. The OC solution is contact activated and instantly covers the whole face. The concentrated formula immediately inflames the eyes, nose, mouth and throat of aggressors, causing temporary blindness and immobilization. Defense Technology's innovative 360-degree technology and larger trigger button offer lightning quick deployment from any angle or position. The three-ounce container offers 20-25 bursts with an effective range of up to 12 feet.